This week we’re giving thanks for all of the crazy things past roommates have done to bring us the story for today. And thank you to our wonderful audience who came to hear this story told live in September at the Red Poppy Art House in San Francisco. 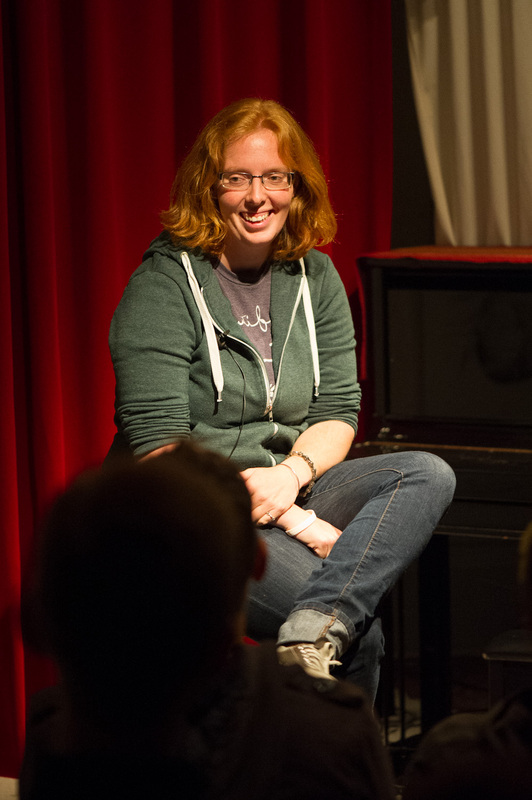 Rebecca tells her story of odd roommate encounters at the Red Poppy Art House. Photo by Chris Coster. Rebecca is one of Spokespeople’s co-founders. Hailing from Massachusetts, she currently is perfecting her skills as a jack-of-all-trades as she dabbles in teaching horseback riding, fixing bicycles, non-profiting, leading outdoor trips, and coaching rowing. If you enjoy storytelling, you should consider hiring her. If you don’t enjoy storytelling, you should still consider hiring her because everyone loves a ginger. Photo courtesy of littlefishyjes via Flickr. Tags: podcast, roommates, spokespeople, spokesppl, storytellers, storytelling, storytelling event. Bookmark the permalink. Previous post ← We’re back at Actual Cafe on Sunday, December 9th!